Designed by Bill Shaw and built to the highest standards by Pearson Yachts, MOONSHINE features a shoal draft, displacement hull form with an efficient centerboard that combine to provide excellent upwind performance, comfortable motion in a seaway and tremendous interior volume for a yacht her size. Her draft of four and a half feet with centerboard up allows access to less crowded cruising grounds normally limited to much smaller yachts. 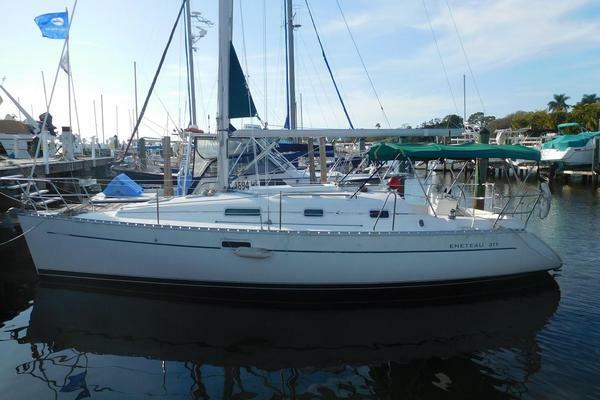 MOONSHINE has benefited by a complete overhaul with many recent upgrades and is well equipped for extended cruising. MOONSHINE can sleep up to eight in two cabins. The forward cabin has a large V-Berth with a seat in the middle and a filler cushion that can be used to create a double berth. There is a hanging locker to port and three generous drawers to starboard. Above the bunk are numerous storage cubbies. Overhead is a large Bomar hatch which provides excellent ventilation. Beautiful teak and holly cabin soles throughout the yacht. The tasteful upholstery and curtains are in shades of blue. New foam in cushions 2017. The main salon has a beautiful teak holly drop-leaf table that can seat up to eight. There are two berths, one each on port and starboard, the lower of which pulls out to make wider. The forward-facing navigation station is on the port side forward of the port aft bunk, featuring a large chart table with storage under and new B&G electronics. The U-shaped galley is attractive, with white and wood accents. A large ice box with new refrigeration and ice maker aft, dry storage forward and a three-burner propane stove in between. A two-basin stainless steel sink has a hot and cold faucet as well as a foot pump and filtered water. New water heater 2017. The enclosed head with shower is ample in size and storage. There is a new Jabsco toilet, sink, vanity, shower, mirror, and hatch for ventilation. The hull in constructed of hand-laid solid fiberglass with end grain balsa core. Hull is white with blue cove stripe and red waterline stripe. There is also a teak varnished toe rail. MOONSHINE draws 4’-3” with centerboard up and 9’-6” with centerboard down.